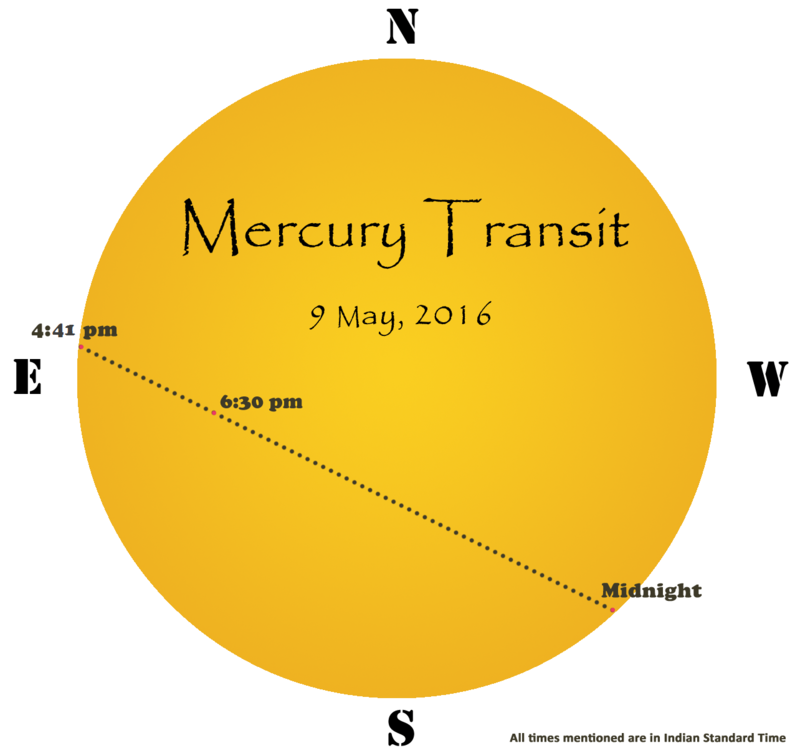 The tiny inner planet Mercury will be seen passing across the Sun (transit) on Monday, 9th May, 2016. Although the event will happen fourteen times this century, the next one visible from India will be in 2032. Hence the 2016 transit is a great opportunity to watch this mini-eclipse and also for us to utilise for astronomy outreach. The ASI-POEC has created a resource base on this page for anyone to see and share the transit. Scroll below for lots of Events, Resource material, Information and Suggestions. Click Sun icons for details. Do check back again as events are still being registered. See below to register your own. The ASI-POEC call for sharing the transit met with a great response and co-ordinated efforts were done by telescope owners and science popularisers across the country, leading to more than 250 events. At all these locations volunteers were ready to show the Transit to the general public through their telescopes and they were registered on the national map by May 9th so that local public could find them. We estimate that more than 75000 people managed to see the transit through this campaign. Live webcasts too were registered from seven locations; many people got to see the transit at least online, overcoming reasons like bad weather etc. A handbook on observing the Sun and the transit as well as additional resources were featured for free download on the ASI-POEC website for educators to access useful information. If you have a small telescope, know how to project the Sun's image, and have access to a public location from where the western sky can be seen clearly, try and set up an observation by inviting the local community to come and watch the Transit with you. Join us in a nationwide effort to share this spectacle with all people. Please use the form linked below to register your event. The event starts after 4:30 pm and is visible all over India. The first contact occurs at ~16:41 IST; however the entrance of the dot may go unnoticed since the contrast at the edge is not sufficient enough. Within minutes the planet Mercury will appear as a tiny dot on the Eastern limb of the solar disc and will become identifiable. Watch out for other sunspots too that may be present. Path & important times of the Transit for Indian observers. Mercury will appear as a dot on the solar disc moving roughly from East to West. For an Indian observer this would mean that Mercury will move from the "top" towards the "bottom" of the Sun as it moves towards the western horizon. As the dot moves inwards the center of the Sun's image, the visibility will improve. Mercury will be at a quarter of its path in front of the Sun at about 18:30 IST. The central point occurs at 20:27 IST when the sun would have set long for us in India. The best opportunity to view the transiting Mercury is after an hour into the event, when the effect of atmospheric absorption is still not strong enough. The transit continues beyond the sunset. Hence it should be safe to try to look for it or photograph it on the setting Sun. However the size of Mercury being small, recognising it as a black dot requires extra effort. A magnification tool (binocular / telescope) is definitely needed unlike in the case of Venus in 2012, which was strikingly noticeable as a fairly large spot. In India, we will catch only the initial part of the transit before sunset. Most of Central and South India will see up to the initial 1/4th of the transit and North and West India will see the initial 3/8th of the transit. The Eastern part of India will see the initial 1/8th of the transit only. This translates to 2 hrs, 3 hrs and 1 hr respectively. Discounting the last hour (haze, clouds, dust, landscape etc), that gives us 1, 2 and 0 hrs respectively. This is what we will have to work with and make the best of. In addition, it is obvious that since Mercury is only 1/158 of the Sun's apparent diameter, a telescope with a magnification of 50x or more is needed to watch this event. See below for help with this. Warning: It is very dangerous to observe the Sun through any unfiltered optical system (lenses, binoculars, telescopes & even your bare eye). This may cause serious eye damage and even blindness. The transit observation also involves looking at the sun and hence all the precautions that apply to the observations of Sunspots and Eclipses apply here too and are essential. * Projections with small telescopes, similar to those done for solar eclipses, would be ideal. We recommend this method as it can give you larger images and they can also be shown to many people. Please see this link for various methods of Projecting the Sun. * Good quality "Eclipse goggles" (without any tiny holes in them!) may be used, but Mercury will be very hard to spot with the naked eye. * Another arrangement will be to put Mylar sheets or commercially available Solar filters in front of the objectives of the binoculars / telescopes that you are using. The magnification provided by binocular should suffice to show the event. Warning: These filter need to be put so that they cut out light BEFORE it enters the telescope. Make sure of that before you put your eye to the eyepiece. Can you provide some information about the visibility of the 2032 transit of mercury from India ? I am also very much interested in observable astronomical events. With my one reflector telescope and one goto refractor telescope, many times, I arranged sky gazing programs for my small town peoples and students. I also calculate the transit path of mercury for 9th May 2016…and also going to arrange a program to show mercury transit for my town people. Sir, I hope you will provide me some help, if I need it, for arranging the transit observation program. I am having the memories of past event “transit of Venus”, was photographed by me till the end of the event. I had studied the same and now I am eager to see the forthcoming “Transit of Mercury” on the terrace of our building on 9th May 2016 for which I am waiting from last couple of year. I hope the sky will be clear on that day. My best wishes to all the sky watchers..!! We at St.Philomena College, Puttur have Reflecting Astronomical Telescope, would like to see the celestial spectacle and arrange the programme for general public. Going to observe and imagine the event from Manjri Bk. Pune. Equipment – 10 ” dobsonian ,8 “f/6 on Neq-6 Mount.QHY-5 II L-mono & Canon 60 D.
Found this article very informative and precise. Learnt a good many things. Hoping to witness the upcoming event following the articles guidelines. Thank you. I bring your kind attention that the Bengali version of the material has been modified by Shri Bipash Dasgupta himself, which contain a new chapter of Transit Frequency, That may be uploaded. In condition of communicating with him, myself can provide the PDF file. it is good afforts but it will required coordination with verious institutions &VOs for education campagion j,,,,,,,,,,,,,,,,,,,,,,,,,,,,,,,!!!! Very exited to watch the transit, I particularly purchased a solar filter to observe this event. Disappointed that it can be seen only about 1 hour from India as the transit is as along as 7 hours. I wanted to see it when it reached the center point its path. Nevertheless, this will be an eye feast for space enthusiastics, if I can manage good pictures of this celestial event I shall send them to you! Thank you for the tips. Can’t wait to witness the rare event! Thanks for this information . I was very curious about mercury transit in India ! I am pleased to realize that so many people in India attempted to project the image of the transit of Mercury. I used a Celestron Astromaster LT60 (60mm objective lens only) with a 10mm eyepiece. I projected onto a small (hand held) pad of white paper while there was a gap in the clouds at about 12:30 BST. I briefly saw the transit of Mercury for the first time at 65 years of age! eagerly waiting for token certificate. We amateur astronomers of poornaprajna college udupi enjoyed the event . More than 100 public witness the programme. કચ્છ એસ્ટ્રોનોમી ક્લબ દ્વારા ક્યારેક બનતી બુધ પારગમનની ખગોળીય ઘટનાના અવલોકન નો જાહેર જનતા માટે એક કાર્યક્રમ મુન્દ્રા રીલોકેશન ચાર રસ્તા શાળા ખાતે યોજવામાં આવેલ હતો જેમાં વિદ્યાર્થીઓ સહીત મોટી સંખ્યામાં ખગોળ રસિકો ઉપસ્થિત રહ્યા હતા. આ ઘટનાનું મહત્વ સમજાવતાં ક્લબના પ્રમુખ નરેન્દ્ર ગોર સાગરે જણાવ્યું હતું કે પૃથ્વી અને સૂર્યની વચ્ચે આવેલા બે ગ્રહ શુક્ર અને બુધ ક્યારેક સીધી લીટીમાં આવી જવાથી પારગમનની ઘટના બનતી હોય છે. ચન્દ્ર ખુબ નજીક હોવાથી તે મોટો દેખાય છે અને સૂર્યની આડે આવતાં સૂર્ય ગ્રહણ થાય છે જ્યારે બુધ અને શુક્રની આવી ઘટના પારગમન કે ટ્રાંઝિટ તરીકે ઓળખાય છે. છેલ્લે ૨૦૦૩માં કચ્છમાંથી બુધ પારગમનનું અવલોકન ક્લબ દ્વારા કરવામાં આવેલ હતું હવે પછી ભારતવાસીઓ ઈ.સ. 2032માં આ ઘટના નિહાળી શકશે તેમ જણાવી ભુતકાળમાં આવા પારગમનો દ્વારા સુર્ય અને પૃથ્વી વચ્ચેનાં અંતરો શોધવા ખગોળ વૈજ્ઞાનિકોએ કરેલી મથામણની વિગતો જણાવી હતી. બરાબર ૧૬.૪૨ કલાકે બુધ સૂર્યની તકતી ઉપર પ્રવેશ્યો હતો જેને ઉપસ્થિત ખગોળ રસિકોએ ચિચિયારીઓથી વધાવી લીધો હતો. જેમ જેમ સમય પસાર થતો ગયો તેમ તેમ કાળા ટપકાં સ્વરૂપે બુધ વધારે સ્પષ્ટ રીતે સરકતો જોવા મળ્યો હતો.જે નઝારાને સૂર્યાસ્તના સમય ૭.૨૩ સુધી ઉપસ્થિત જીજ્ઞાસુઓએ પાણ્યો પ્રિયાંક મહેતા તેમજ નિશાંત ગોરે આ ઘટનાની ઈમેજીંગની કામગીરી કરી હતી. તો ભવ્ય ઠક્કર તથા કર્મવીર જાડેજાએ બુધ માર્ગ અંકિત કરવાની કામગીરી કરી હતી. કચ્છ યુનિવર્સિટિના મહેશ ઠક્કરે બુધ ગ્રહનું ટેલિસ્કોપથી થયેલ પ્રોજેક્શનની સ્પષ્ટ તસવીર નિહાળી આનંદ વ્યક્ત કર્યો હતો.આ પ્રસંગે ગૌરવ રાચ્છ નામના વિદ્યાર્થીએ જાતે બનાવેલ ટેલિસ્કોપનું નિદર્શન કરી ટેલિસ્કોપની રચના વિશેની સમજણ અનીલભાઈ ડાભીએ આપી હતી. દયારામ જણસારી,કિશોરભાઈ ચૌહાણ વિ. એ વ્યવસ્થા સંભાળી હતી તો ઝુંબેશભાઈ પોમલે સહયોગ આપ્યો હતો.